The Overview consists of five 20 minute presentations with additional reading and a post-quiz. Energy affects women and men differently, as men and women have different roles and responsibilities in households, markets and their communities. This makes their access, use, and the impact of energy services also different. 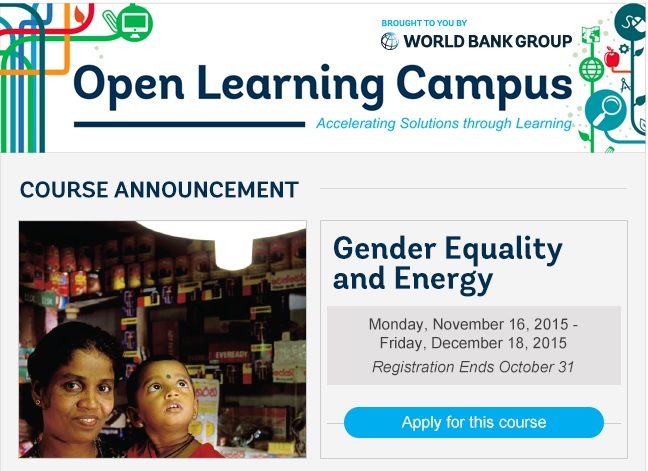 This facilitated 5 week course explores linkages between gender and energy through video presentations, readings, quizzes, interactive problem-solving exercises, and online discussions. Target Audience: This module targets multiple stakeholders, especially social development and energy specialists, including policy makers, practitioners, and civil society organizations’ staff that have a special interest in a more in-depth look at issues related to gender and energy.